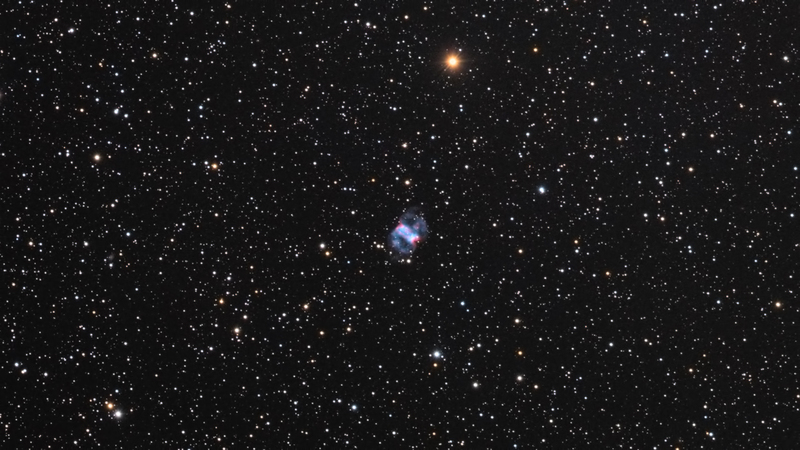 Messier 76, also called the Little Dumbbell Nebula, is a planetary nebula in the constellation Perseus. It was discovered by Pierre Méchain in 1780. Distance to M76 is currently estimated as 780 parsecs or 2,500 light years, making the average dimensions about 0.378 pc. (1.23 ly.) across. The total nebula shines at the apparent magnitude of +10.1 with its central star at +15.9v (16.1B) magnitude. The Little Dumbbell Nebula derives its common name from its resemblance to the Dumbbell Nebula (M27) in Vulpecula.